A simple yet ornamental coffee table. It features an extremely heavy gilt cast iron solid base and a thick oval glass top. The table is in excellent all-around condition and showing very light signs of use. A very rich and chic looking cocktail table that can marry with many design aesthetics. 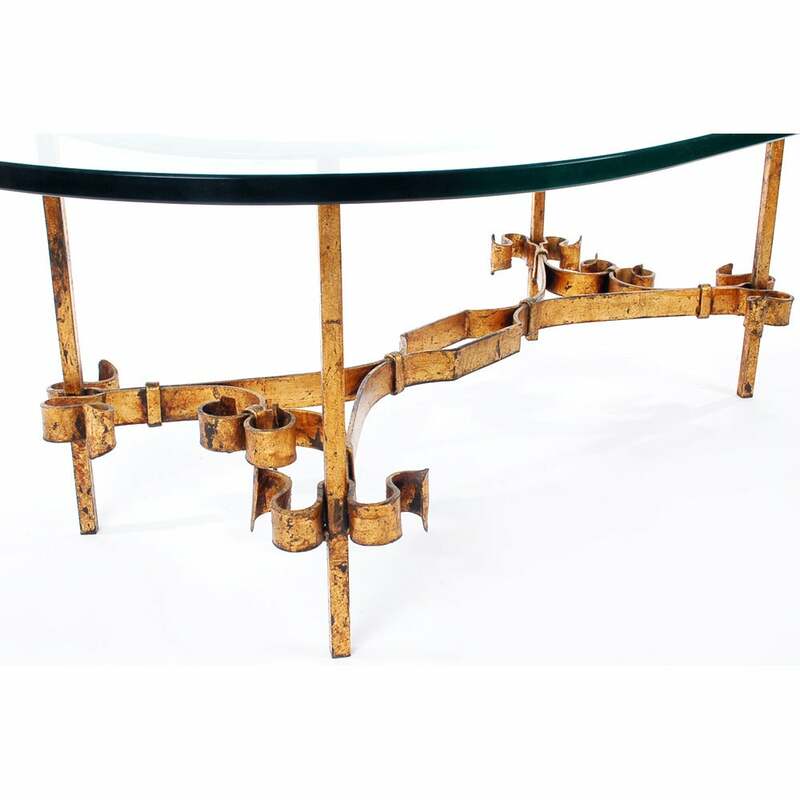 It features a solid wood gold gilded base with heavy glass top. A chic looking two-tone coffee table with a Gazelle head motif. It features brushed stainless steel and solid brass frame, with a thick heavy glass top. A very elegant two-tone designed coffee possibly by Labarge or Maison Jansen. It features aluminium, brass and glass construction. Finely made Hollywood Regency piece. (unmarked). A sleek and modern brass coffee table with an Asian flair. 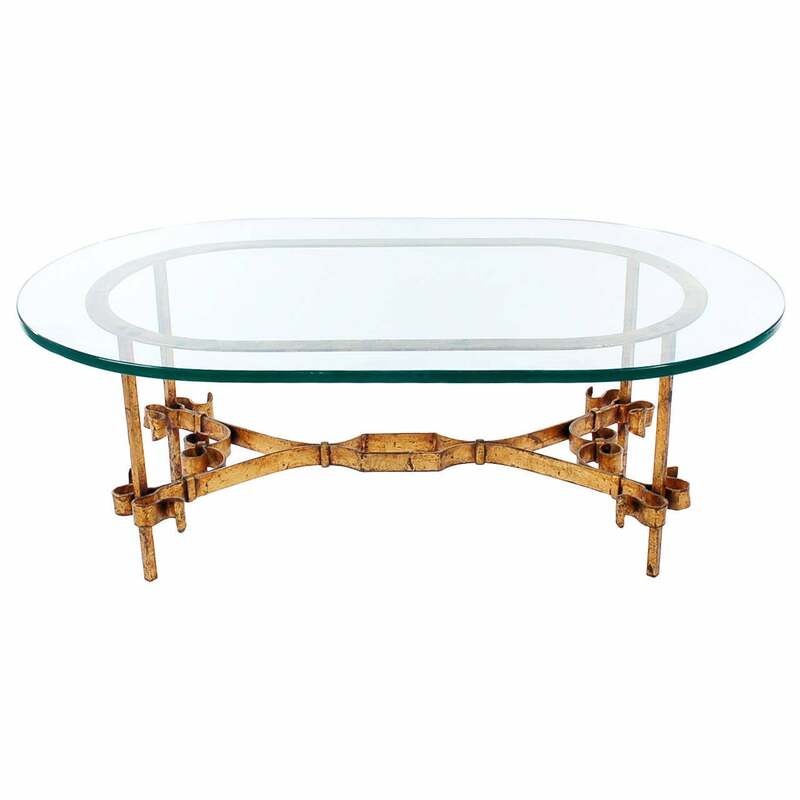 It features a heavy solid brass frame with a thick glass top. Labelled and produced in Italy in the 1970s. 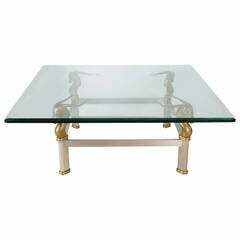 Hollywood Regency style coffee table with black marble and gold-plated structure with glass tray. Square vintage 1970s swan table glass top coffee table with mirrored under shelf. Features Lucite legs shaped like swan necks with gold beaks. Measures: 109 W x 44 H x 109 D cm. Hollywood Regency style decorative gilt leaf base with glass top coffee or low table. Having a circular table base sprouting a leaf plant design under a circular glass top. 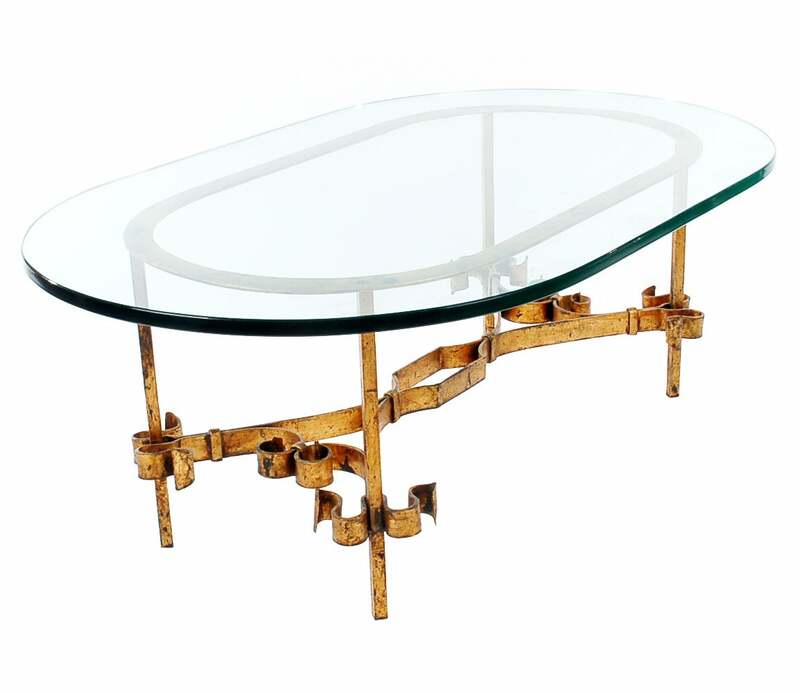 Intricate brass and curved Lucite legs rectangular coffee table. Clear octagonal glass top. Hollywood Regency black steel rectangular faux bamboo coffee table with brass corners and details. The smoke glass top finishes off the elegance of this beautiful piece.